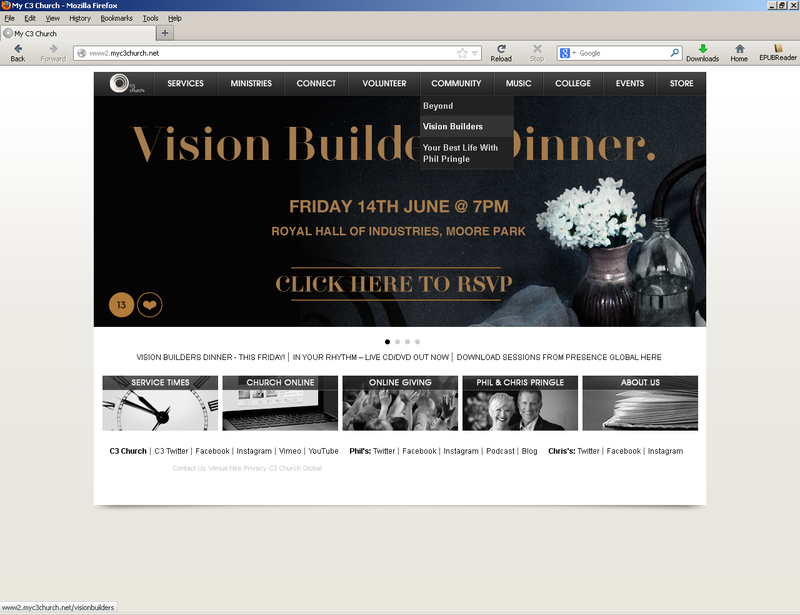 Phil Pringle invites convicted felon, Yonggi Cho, to speak at C3 Church Oxford Falls. We here at ChurchWatch have followed, and documented the scandal Dr Yonggi Cho was involved in. It was not long ago that this man was found guilty of serious charges. On 20 February 2014, Cho was found guilty of tax evasion, sentenced to three years imprisonment, suspended for five years, and fined the equivalent of almost $5 million. His oldest son Cho Hee-jun was sentenced to three years imprisonment. The charges arose from Cho’s church purchasing shares from his son’s church at above market value and fraudulently claiming tax relief. To this day, Phil Pringle continues to lie by omission, praising Yonggi Cho but neglecting to tell his church of Cho’s crimes. It comes to our attention that Phil Pringle has invited this false prophet to speak at C3 Church this Thursday February 25. We leave it up to our readers to decide on the appropriateness of this invitation for Yonggi Cho to speak as a church “leader” rather than as a convicted felon, (a person convicted in a court of law of a felony crime). And yet C3 hypocritically state “we love Jesus and people”? TRANSPARENCY, ACCOUNTABILITY AND GOVERNANCE – WHERE IS IT? The context of the above scripture has Jesus explaining how we should listen. What I have been seeing at C3 church is a lack of the leaders hearing the words of Jesus and instead hide things in secret so they do not get caught. After reading various articles on this site, researching C3 church further on the web and attending C3 Conferences, I feel compelled to share some thoughts and information with you in this article. As a Christian attending a C3 church over some year, I believe what I have seen and heard in C3 needs to be examined further. After reading this article you will see why. When I had left C3 Church Balmain/C3 Church Rozelle, I was so disbelieving that the senior pastor Ward Lucas’s ‘love’ for us could have resulted in such an outcome that I kept asking questions about finances. I only wanted to know what had happened to the large sums of money given into their control by my wife and I and others, just to make sure our expulsion hadn’t been some kind of grotesque cover-up. At first I was met with fob offs, then silence. So I went as far as to start court proceedings, thinking perhaps they were just being difficult because they could and they ‘loved’ us so. They’d thrown me out for ‘pretending’ that they were not accountable, surely they’d have no problem providing proper financial accounts to me then? On the contrary, they went on to prove during a four year court process that as well as making sure they’ve set themselves up to avoid any legal obligation to provide financial information to church goers, they’re also prepared to spend signficant time and money in litigation to avoid it. They did all this with the energetic assistance of Mr Paul Macken Solicitor, of C3 Church Oxford Falls. The actual reasons for this painful display only became clear at the death, after years of ducking and weaving. 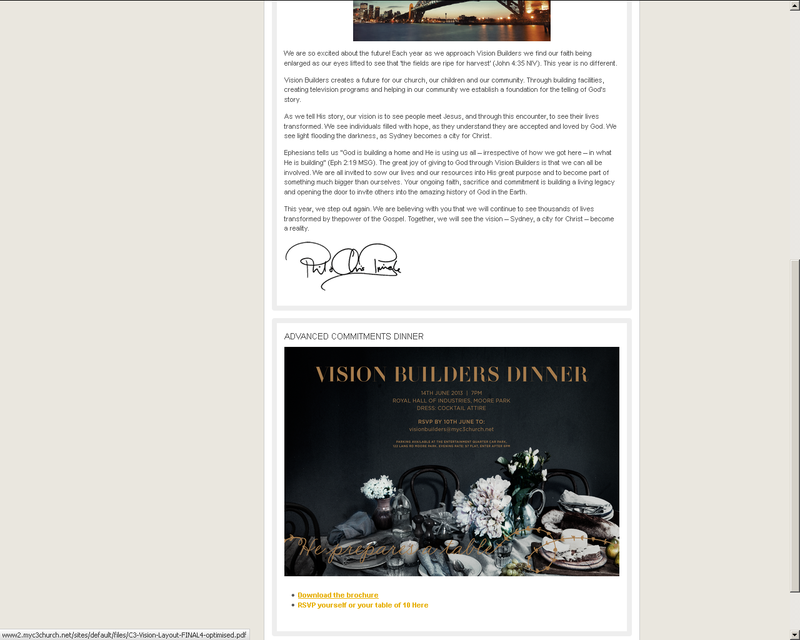 C3 Church Balmain/C3 Church Rozelle had taken $20K I had given them specifically to be used for a building fund, that came from my late father’s estate, and tipped it into something else. At one point according to my forensic accountant, the money seemed to spend some quality time in an C3 Church bank account called ‘pastoral account’, that was apparently used for pastor Lucas’s expenses. This was written up by the church accountant as a mistake. And although I clearly recall specifically telling pastor Lucas what the money was to be used for, he signed an affidavit sworn on the bible saying I did not give the money to be used for a building fund, I was making that up. Odd, because when C3 Church Balmain/C3 Church Rozelle got the money they wrote on the cheque the words ‘building fund’, and put it into an account where it remained for years labelled ‘building fund’. 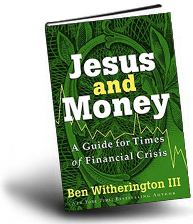 According to pastor Lucas, notwithstanding the church’s own records, the truth was that I had given it to them to use for a later fund that did not come into existence until years later, one that was used for things that included buying chairs, musical equipment, paying insurance and accountants fees. But then, at the door of the court, after the years of ducking and weaving, faced with a judge who might actually consider things like the church’s own records, C3 Church Balmain/C3 Church Rozelle decided they didn’t want to roll the dice on that yarn, and paid all the money back to me. Which reveals the truth of the matter more succintly than anything I can say. So test the claims. Jesus is not reported of speaking of an unforgivable sin of asking about money, questioning or disagreeing with religious leaders. Instead, he blasted religious leaders who neglected justice and mercy and threw those making money out of the temple. And then those same religious leaders killed him for it. Senior pastor Ward Lucas worked diligently to remove my family and I in 2008, well aware of the issues with the cash that we had started asking about. 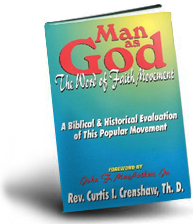 His assistant pastor Anthony Grant, who also often claimed to ‘love’ us, helped put it into effect. The ‘love’ proclaimed by them so often before we asked about their use of other people’s money had become something else entirely. I’ve had more genuine enemies, who at least didn’t pretend for years to ‘love’ me. The C3 Church Oxford Falls overseers, Steve Janes and Mark Kelsey, who knew all about the circumstances backed pastor Lucas to the hilt. They didn’t even speak to us before reportedly judging us to be liars based only on the say so of pastor Lucas, and recommending our forced removal. No one protected us, or our kids. So why would they protect you? As Tom Adam explained on his website, it appears C3 settled with him on the Supreme court steps early this year. Being a solicitor with a strong family history of members involved in Law, he was a very brave person to threaten them and win. Obviously, Phil Pringle didn’t want the scandal to be made public. I believe very few people at C3 overseas and in Australia know anything about what happened to Tom Adams and other church members at C3 Balmain. HOW DEEP DOES THE RABBIT HOLE GO? For more information on the C3 Balmain scandal, click on the link below and go right to the bottom of the page and click on the subpages to follow on. What you say is right on the money. Seven members of my family were expelled by force from C3 Balmain after asking to see properly kept accounts of the church’s Rise and Buile fund to which they had given more than $100,000. The church leaders are now in the Australian Supreme Court defending themselves against among others our Attorney General’s Department. C3 Church Balmain is set up so that there is no independent oversight whatever of the use of funds donated to it. What strikes me is that these guys convince you to give money to them by telling you if you give to God, you’ll prosper. They are the ones who gain out of that arrangement. The lawyers in my family’s case have found everywhere in the C3 movement dodgy private companies; dodgy incorporated associations; and church’s with massive assets that are not actually owned by the church community, but effectively by five or ten people–the Pringles of the world. Keep protesting is all I can say! The fault doesn’t lie in any particular company (as in say such and such company is alleged to be skimming money). The problem lies in this (this is what has got the Attorney General interested). If you’re a not-for-profit you’re supposed to be set up so that you have enough formal members to have an independent majority ensuring that you don’t misuse funds, and that you are looking after those regularly involved in your organisation. C3 churches appear to set themselves up so that the legal entity behind them has a handful of members. In which case there is no independent majority overseeing the finances and protection of ordinary attendees as required under the Charitable Fundraising Act. At this stage white Horse hasn’t been mentioned, although I’ve read about it. God speed one and all! What this means of course is that unless you are a formal member of the association/company that is your C3 church’s legal entity, you in fact have no legal rights as an attendee of the church. In addition it means that all the assets that look as though they’re owned by your church community (buildings/fittings/land) are effectively owned, not by the church community, but by the five or six formal members of the legal entity. It also means that the handful of members of the legal entity have iron control of finances. 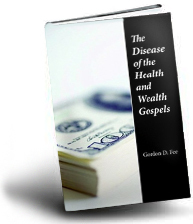 If the majority of them gain financially from the spending of the church’s money (ie because they are employees of the legal entity as well as controlling it), then…? Be it said significant breaches of the Charitable Fundraising Act make you liable to a jail sentence. Re C3 Balmain–naturally I can’t go in to any detail that involves the court business. What I’ve done on my site, and my brother has done on his, has been to confine ourselves to irrefutable facts. The explicit information contained on those is supported by copious documentation. That stuff I can chat about. With respect to Kelsey’s involvement, no-one knows at all what it was. Lucas and Grant apparently said one thing at the time; but as my brother’s site indicates Kelsey, via his lawyer, is so vehement in denying any involvement the literal meaning of his denials seems to be that he has nothing to do at all with C3 Church Balmain, and that he isn’t even a leader in the C3 Church movement. None of us can make head or tail of that! Here is my brother’s take on things re Kelsey. He is the senior lawyer involved in the case against the leaders of C3 Balmain. Thank you for your kind thoughts. There is so much here, I can’t reply in detail to it; but I appreciate your remarks. I will try in later posts to come back to anything you’ve written, if it seems good to. In the light of the posts that have followed mine I thought it most important to clarify my own position about a few things. I co-led an independent church for ten years. I founded a not-for-profit organisation working with victims of domestic violence. I wrote its constitution so that it complied with our laws. So I know from that point of view what our laws require both in founding and administering this kind of group. The following is ultimately my reason for writing my own web site, and for being on this page. As it happens, this is what Tom and I both really care about. The failure to provide explicit constitutional protection to attendees of C3 churches is a profound evil. It is a massive scandal in waiting. Why deny them these rights? These are rights that are supposed, under Australian law, to be extended by every social organisation formed here to every person who can fairly be said to belong to that organisation. If you do not comply exactly with the relevant government department’s instructions in setting up a not-for-profit organisation, and if you do not comply exactly with its rules thereafter, you break the law. And you break it over and over in the ordinary running of your organisation. As well, even if you do not allow church attendees to become members of your church’s legal entity, you are required to extend the basic principles of your association’s constitution to every person who comes under your care. If you do not—you break the law. Serious breaches of the Charitable Fundraising Act make you liable to a lengthy prison sentence. No rigorous scrutiny is presently carried out by the NSW Government, to check whether not-for-profits in practice set themselves up in compliance with instructions. Nor are the financial documents submitted to government departments by not-for-profits here rigorously scrutinised. The idea that a not-for-profit is probably on the up and up because it is allowed to come into existence, and because it later submits the requisite financial documents to the relevant government department without trouble arising, is false. This lack of scrutiny is in part where the problem lies. It is the way C3 Balmain is set up that has led to a situation in which the only way Tom can learn where his inheritance from Grandad went is to through a Supreme Court decision. 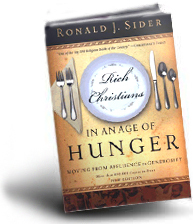 If the church were set up properly, there would be properly kept accounts. If there were no accounts there would be a procedure for handling the matter internally, that would involve trouble for anyone failing in their accounting measures. Tom wouldn’t be blamed for asking, and insisting; those who would not answer would have to face the music. There would be music to face. Should the internal procedures in place fail the minister for Liquor, Gaming and Racing could intervene. Without these things…it’s as you see. Lucas and Grant face five years of nerve-racking court proceedings, with who knows what for them at the end. With respect to the way not-for-profits are supposed to be set up and run, don’t ask your pastor, and don’t accept my views either. I suggest you call the relevant government department, and get the bundle of information that is given out to those who wish to start such an organisation. Then read it. Or search the web. Here is a good place to begin. It is plainly taken for granted by this document that not-for-profit organisations (a) will allow all people working in them to possess full membership of the organisation; (b) will have a properly written and binding constitution that applies to all these members; and (c) will be governed by a board voted into office by a body of members that extends to all workers in the charity. It is also plainly the case that the rules applying to members of the organisation will automatically apply to anyone whatsoever who works in the charity. It is plainly not expected that your not-for-profit with fifty people active in its running will have five legally recognised members. It is plainly not expected that employees of the charity will be paying themselves from donations because they form the majority of the organisation’s membership. It is plainly not expected that members of a not-for-profit which is set up bodgily are within their rights to apply the constitution only to themselves, and not to everyone else working in some capacity in it. The whole purpose you’re allowed to form a legal entity of the kind talked about here is that you are thereby going to be able to give legal protections and standards of behaviour to all persons involved in your charitable work. This document is obviously not written so that a religiously minded person who is a good salesmen can create an authoritarian system of religious government in a church, and thereby come into joint possession of large assets with five friends (or worse family members)—much of it bought by other workers in the charity. C3 Balmain is definitely not set up in compliance with the expectations of the document in question. And how far in the C3 movement does the same thing run? Eventually the Tax Commissioner and the Minister for Liquor, Gaming and Racing will work out what is going on, and then…. 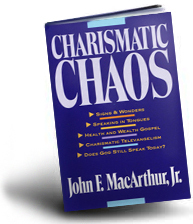 The burning questions are, do C3 churches as a matter of fact set themselves up with dummy constitutions to please the Department of Gaming and Racing, etc? (ie Constitutions whose content bears no resemblance to the church’s actual workings?) And do they then systematically operate in a manner that, if it had been revealed to the authorities from the beginning, would have meant that they would have never been allowed to exist in the first place? If the answers to these questions is yes, then the C3 movement in NSW is apparently guilty of a widespread and deliberate fraud. G’day, Teddy…just had a spare moment. The money was donated to the Rise and Build Fund of C3 Balmain. Lucas and Grant can’t or won’t produce a properly kept accounting of the use to which the money was put. So we have no idea where it has ended up. Apparently, it might take a forensic accountant to discover its whereabouts (ie whose account it is in, what is was spent on, whatever)–and even then there is uncertainty whether such a person would find it. We have never heard that Grandad’s money might have gone to Oxford Falls. If that really is where it has gone, what motive could Lucas and Grant have for not saying straight out where is was? Most confusing…. I’m enjoying following the conversation. Tom is, too, and I’m sure he’s finding the aspects relating to his stuff encouraging. RP, thanks for your kind thoughts. Teddy, this is my church background (thanks for asking)–Dad was a Prezzy minister; Mum was a missionary. I went to the Prezzies till my mid-twenties; then I went to a cell church for ten years. Then a C3 Balmain/other churches mix for eighteen months. Then the Anglicans for a few years; but its youth work collapsed (I have young kids). At present we go the the local Baptist Church, which has an excellent youth program. With respect to C3 Balmain, (I noticed some confusion about this, so it’s good to clear it up), I went there occasionally over about 6 years, and fairly regularly for a while. However, I was never convinced, so I moved on. I wasn’t going there when Tom etc were thrown out. The help I’m giving Tom, apart from fraternal support, is much more to do with my particular experiences and training than with my intimate knowledge of the church’s workings. (Apart from the things I’ve already mentioned, I worked as a social worker for a number of years. Another one of my areas of expertise both in and out of my current studies is the language-use of criminal tyrants–ie domestic violence perps, religious leaders in breach of the principle of natural justice etc..
That being said, Tom was extremely wise in his dealings with Lucas and Grant. About a year before he was chuckled out, he noticed problems with the legal set up of the church. He pointed them out to Lucas and Grant, thinking these problems had arisen by mistake. He was not encouraged by their response. So from that time on he had (if memory is correct) one private conversation with Lucas about anything significant. And there were two witnesses present at that conversation. Otherwise he conducted all meaningful communications with Lucas and his superiors in writing. In other words, there is a permanent record of basically all his actual behaviour in his treatment of Lucas over a long period–a period which began before he and Lucas were in dispute. I’ve read all the documents available–apart from the most damning one with respect to Lucas’s own personal integrity, which Tom has never shown me, although I know its contents. The speculations about Tom’s behaviour towards Lucas are understandable–but the worst he can possibly be accused of doing is writing him a moderately ill-mannered letter. And really, the tone of his communications is pretty good. In my view, his greatest fault in Lucas and Grant’s eyes was that he kept quizzing them about whatever legal problems he perceived. Not long before he was thrown out, he pointed out to them that lawyers have to reveal legal problems, or they face being disbarred (of course what else could he do?) In my opinion this was as much of a problem as the issue of Grandad’s money. To me, it was that which broke the camel’s back–Lucas and Grant had a lawyer with a conscience in their midst, and a set up whose legality was…highly dubious. Peace be on the heads of all! Once again, I’ve enjoyed reading people’s remarks. Re the exemption of religious organisations. This is my view (and Tom’s). (1) The Charitable Fundraising Act is a codification of already existing laws that apply to all groups existing for charitable purposes. It adds no new laws; it codifies what is already there. Its substance applies to all groups of this kind, regardless of the exemption. (2) According to the Hansard documents, the exemption was only given to religious organisations because those with a good reputation–ie the mainstream churches–already complied fully in their running to these laws…so for instance the laws were already accommodated by the churches’ constitutions, and these churches were properly complying with their constitutions. (3) The Charitable Fundraising Act empowers the minister to remove this exemption from any religious group deemed to be failing in its keeping of the laws codified by the Act. That is to say, despite the exemption it is expected that religious groups will nonetheless do what the Act says–seeing that if they don’t their conduct will be policed via the removal of the exemption in their case, and the application of the details of the Act to their actions. (4) The upshot? The exemption doesn’t mean religious groups are exempt from the law–it is on the contrary a nod to the integrity of the mainstream churches, who don’t need the code provided by the Act because they were already complying with its substance, still do that and presumably always will. The crucial point here is not exactly which act, and which minister, and so on, though. The crucial point is, do C3 Church’s set themselves up in contradiction of NSW law by adopting a democratic etc constitution according to its requirements, with every intention thereafter of ramming in practice an authoritarian system of government down the throat of those laws? It doesn’t really matter how many Acts of Parliament don’t apply to the C3 church. Ultimately the illegality of their behaviour (should it be illegal) will not be affected. The question, ‘Which sentence of which Act?’ is not really relevant–other than in settling on the precise sentences, clauses etc of NSW law that may have been broken. 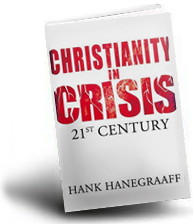 On the question of the rights and wrongs of dealing with certain problems outside the church. I agree with all of you who think that if it’s very serious, you give the church an opportunity to deal with it inside the church. If the church won’t deal with it, then you deal with it in the other places available. And with many serious problems, you are required by law to report them; and lawyers face being disbarred if they do not report them. In this situation, it is our opinion that we have no choice but to pursue the course we are following. It’s worth pondering the fact that at any time C3 could solve the part of the dispute involving Grandad’s money, merely by showing (as is required by charitable laws) a properly kept accounting of the money’s use. That C3 hasn’t implies, as far as I’m concerned, that the movement is quite happy to ride out financial scandals. Again, BB, throught the centre of the target. TVD is the worst advocate for Lucas and Grant and the C3 movement imaginable. In the short time I’ve been here he has (a) made up NSW law; (b) advocated a dictatorial system of church government that is contrary to charitable laws in NSW, and utterly contrary to the servant model exemplified and commanded by Christ; (c) shown by constant misunderstandings that he can’t read plain English, which means he is not qualified to fulfil one of a pastor’s duties, that being to teach the meaning of the Bible; (d) imputed acts of defamation to Tom and I, which is itself an act of defamation, seeing that he can’t possible prove it; (e)written that he thinks his obligation to uphold fundamental laws applying to him is a ‘vibe’ that he can ignore; shown no meaningful concern for any unjust treatment Tom etc might have received; and so on and so on. This guy is living proof that our concerns are legitimate. I’ve been thinking of taking snapshots of his comments, they’re so damaging. 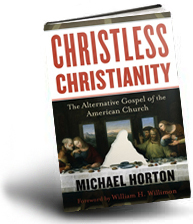 He has basically admitted in writing on this blog that our take on C3 church is spot on. His utterly dismissive attitude to our charitable law is in my view utterly gross. The only reason I engage with any of his questions is because the more rope he has, the more enthusiastically he throws himself into the noose! Does the C3 church know they have this loose cannon blasting wildly in every direction here? We have all seen the corruption, deceit and cover-ups within governments, business corporations and religious institutions reported globally daily in the media. Unfortunately many people have experienced it personally. Usually over time the truth always comes to light in some way. What I have generally noted over many years is that corruption, fraud, deceit and injustice seems to occur when transparency and governance are deficient within the institutions conducting such unacceptable behaviour. As disclosed above, what has come to light in relation to C3’s treatment of Tom Adams, his family and other C3 Balmain members, was C3’s attempt to hide the scandal from its members and the general public. The issues that CHC are facing has some similar issues Pringle is facing (which Tom and Dave exposed). This would possibly explain why C3 settled outside of court to hide this fact. It’s even more revealing C3 has “everywhere in the C3 movement dodgy private companies; dodgy incorporated associations; and church’s with massive assets that are not actually owned by the church community”. This shows that C3 is totally deficient in transparency, governance, and accountability. Is it just a coincidence that it also seems to be the same situation in the other C3 / Phil Pringle associate institutions like Kong Hee’s CHC in Singapore and Yoido Full Gospel Church in South Korea? These issues are what needs to be disclosed, investigated and vigorously discussed in depth. This is to inform others of the deceit and corruption that is going on within these churches out of sight from most honest church members. “Warren Bennis, as quoted in In Search of Excellence, calls the leader a “social architect.” When a leader is a God-person, a God-seeker, vision is planted deep inside. God often speaks in pictures to God-seekers, especially to leaders. Pictures are the visual language of the Holy Spirit to reveal God’s blueprints for what He wants to build.” – Phil Pringle, You The Leader, 2005, pg 34. Keep the above in mind as you watch this 2020 Vision campaign video. Sorry – this is the 2020 Vision campaign video. “Faith without action is dead. Just believing that this vision is going to happen wont make it happen. This vision calls for action. It calls for people to step out. It calls for sacrifice. It calls for stretching. It calls for raising ourselves up to a level we’ve never been before. This action has taken us from seventy one churches in the year two thousand to over three hundred today. It’s taken us from five nations to thirty five nations. And today, we have influence in two hundred cities around the world. This momentum turns a small snowball into a massive avalanche. It’s the power of compounding effort. You and I are involved in a gathering momentum of the great power of God. Because of this momentum, we are seeing six hundred people around the globe come to Christ every week in C3 churches. Because of this momentum, we’re seeing nearly thirty thousand come to Christ every year. Because of this momentum, each week seventy five thousand people are gathering to worship God. God in heaven is with us. It’s his mighty plan to build his church on the earth. It is of our opinion Pringle is purposely blurring the lines with the great commission and His 2020 Vision to get people to commit themselves to his movement and not to the true commission of Jesus Christ. If the 2020 Vision was the ‘vision’ that God gave Christians in Matthew 28 this is perfectly fine. Jesus can give us the faith to go out into the world and make disciples in His name. But is this what Pringle is reinforcing? Not at all. Pringle opens up with the following claim: “In the beginning, God gives us vision”. Already we are off to a bad start. Where on earth does the bible teach this? Pringle adds his own unbiblical theology into his New Age doctrine on vision: “Vision from God always boosts faith from the inside of your soul. As soon as we hear the magnitude of what God is calling us to do, we find faith rising on the inside that this is possible”. Where on earth did he get this from? His liver shivers? Notice also his allusion to him being a ‘Joshua’ in this video when he says, “Just like Joshua knew he could take the land of Canaan, so we know that we can build the church around the world.””. But who gave Joshua the strategy to “take the land of Canaan”? God. So who supposedly gave Pringle the “strategy” to “build the church around the world”? God. Is Phil Pringle your Joshua? This is nothing but subliminal advertising again. While the C3 Media flash snippets of Pringle’s 2020 Vision (“1000 churches”, “500 members”), Pringle claims that “God has given us a strategy”. Wasn’t the biblical Great Commission strategy enough? This indicates that God has given a vision to Pringle that surpasses that of Jesus’ great commission. Why can’t C3 simply follow Jesus’ commission to “go and make disciples of all nations, baptizing them in the name of the Father and of the Son and of the Holy Spirit, and teaching them to obey everything I have commanded you”? That’s right! Phil Pringle is the Messiah! How can we forget this? And what is this God-given strategy? Pringle says that if Christians are to “follow [the strategy’s] pathway, we will find ourselves expanding right around the world”. What a claim! Whatever happens do not question the churches strategies. To do so is to challenge God. Not Pringle. Not C3 leadership. Not C3 church. But God. Pringle then goes on to purposely misappropriate and reword the scripture in James 2 to his advantage. He reworded the scripture “faith without works is dead” to “faith without action is dead”. He then used this verse to convince his listeners to get on board with his 2020 Vision. A pastor should NOT use the scriptures for his gain like this. Pringle used this scripture to justify people to submit to his divine authority through the infallible 2020 vision God supposedly gave him. For Pringle to claim God gave him a divine vision and strategy to fulfill but has the audacity to twist his God’s Word like this is satanic. This was not an accident. This was scripted. This was a deliberate tactic to con people to side with his vision. … Mankind’s natural unit is the Volk, or people, of which the German Volk is the greatest. 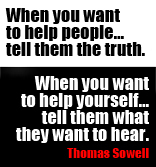 The state only exists to serve the Volk, and both morality and truth are to be subservient to this principle. The Volk must be headed by a Fuhrer, or leader, who must have absolute authority. What then does Jesus tell us to do? We are seeing the reverse with the 2020 vision. God supposedly has bent the knee to Pringle and given Phil the authority in heaven and earth through the “2020 Vision” to make people and churches join his volk (“the great power of God”). Pringle is not saying the “power of God’ is emphasised through the preaching of the gospel which proclaims that Jesus is The Power and The Authority of God personified. Instead Pringle is pushing the idea that thy volk is truth and power, insisting that you be “part of the history making group of people that are changing planet earth as we fulfill the 2020 Vision”. Can you see what is taking the focus now? Not Christ and his great commission. The focus is now on Pringle, his 2020 vision and those who bend the knee to it in his movement. Pringle’s battle cry is for you to be part of a history making crew that are changing the world because they are fulfilling the 2020 Vision. So it should be established that Pringle is using clever marketing gimmicks and lies to deceive his congregation into accepting his fuhrer’s vision. This is man is making his own church with out God’s Spirit. Pringle is teaching the power of God is emphasised through the volk under his “god-given” vision and “god-given” strategy. Pringle is calling YOU to action. Pringle is calling YOU to step out. Pringle is calling YOU to sacrifice whatever it takes to accomplish his desires. This is very different to what we see Luke observing in the early church. CHC trial… to be Kong-tinued? The defense says that there is “no case against CHC leaders” while the prosecution claims that the “accused fed auditors a pack of lies”. The defence lawyers representing the six leaders of City Harvest Church have attacked the prosecution’s case, saying that no evidence has been produced to show that the accused misused church funds. SINGAPORE: The defence lawyers representing the six leaders of City Harvest Church have attacked the prosecution’s case, saying that no evidence has been produced to show that the accused misused church funds. This comes after 42 days of trial and evidence from 14 prosecution witnesses. Chief District Judge See Kee Oon has to decide after the submissions, if the defence has a case to answer. Church founder Kong Hee and five of his deputies are accused of misusing millions of the church’s building fund monies to boost the career of Kong’s wife, singer Sun Ho. They are accused of doing so through “sham bond investments” and by round-tripping the funds. A key argument was with regard to how the charges were framed. The prosecution’s case is that the accused were entrusted with the church funds and had full control over them. But the defence said this was not true. It pointed out that there was no resolution passed by the church board, indicating who were the people who were decision makers and could control the church funds. As such, the defence’s point was that the church board decided on the use of church funds as a whole. Another point made by the defence was that the church’s building fund could be invested and in this case, it was invested in Xtron, which was a firm the church supported and knew about. The money invested in Xtron was then used to fund the Crossover Project, which was used for evangelism and the church members all knew about it. So there was no concealment and there was no dishonesty about it. The prosecution in the City Harvest Church case mounted a stinging rebuttal yesterday as it sought to prove it had presented enough evidence for the trial to continue. Tearing into arguments by the defence, Chief Prosecutor Mavis Chionh strived to show again that the six accused had varyingly cooked deals to misuse church funds, “fed a pack of lies” to auditors and “created false appearances in City Harvest’s books”, reports The Straits Times. “There is clearly enough evidence for the defence to be called,” she said, after taking the court through a summary of the prosecution’s case. She was responding to defence lawyers who had argued that, despite 42 days of trial since last May and 14 prosecution witnesses, the prosecution had failed to show enough evidence for the charges against their clients. The defence wants the case thrown out. The judge will rule on that on May 5. Church founder Kong Hee and five others are accused of misusing about $50 million in church funds in total. While their lawyers had consistently said auditors vetted and approved allegedly suspicious transactions, Ms Chionh said relying on this defence was “misconceived at best and disingenuous at worst” as the prosecution believes the accused hid information from the auditors. She pointed to church auditor Sim Guan Seng, who had said earlier in the trial that he would have “raised some red flags” about certain transactions had he been privy to more information. The defence said some of the information had existed in his audit firm Baker Tilly TFW’s archives. By relying on the auditors’ approval as a defence now, the accused were “like the fraudster who manages to hide his own crimes, then tries to rely on his success in hiding that crime to exonerate himself”, Ms Chionh said. She also disagreed with lawyer Andre Maniam’s assertion that his client, former finance manager Serina Wee, had not been dishonest and could not be guilty of criminal breach of trust since the “church money was used for church purposes”. While part of the allegedly misused funds was spent to advance the pop music career of Kong’s wife Ho Yeow Sun, defence lawyers said the church had accepted her music as a form of evangelism. Ms Chionh said the evidence showed the money had been illegally taken from the church’s building fund. While the defence lawyers said the prosecution had taken e-mails and messages among the accused out of context and misinterpreted them, Ms Chionh disagreed, adding that “the totality of the evidence was sufficient” to call for the defence. The golden triangle is a term we coined to expose the dubious connection of three prosperity teachers. The golden triangle consists of Ps David Yonggi Cho, Ps Phil Pringle and Ps Kong Hee. David Yonggi Cho (of Yoido Full Gospel Church) is both the mentor of Kong Hee (of City Harvest Church) and Phil Pringle (of Christian City Church). Phil Pringle is also a mentor to Kong Hee. Recently, David Yonggi Cho has been convicted of mishandling several million dollars of church funds. We have already seen Kong Hee’s church release an official statement claiming they will stand with the convicted David Yonggi Cho. It hasn’t surprised us that Phil Pringle has said nothing and kept his congregation in the dark over his mentor’s scandal. Furthermore, Kong Hee is in court facing allegations of mishandling church funds of up to US$40 million. Once again Kong Hee is still scheduled to speak at this year’s Presence Conference. We’ve already seen Kong Hee misrepresent the investigations and his court case back in Singapore at Phil Pringle’s C3 Presence Conferences in Sydney. 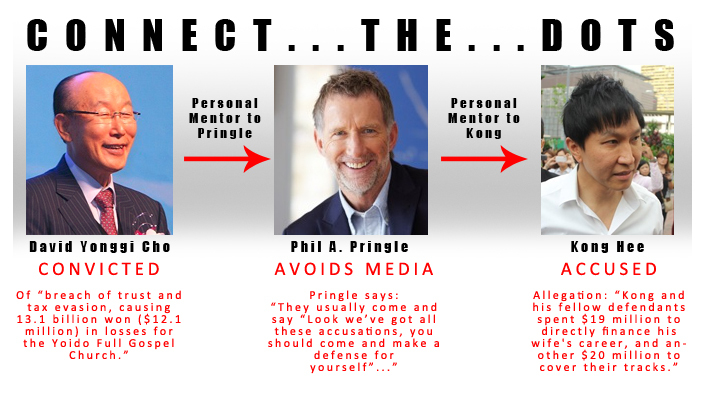 At these Presence Conference events, it is not uncommon to have Phil Pringle hoodwink thousands of Christians to financially support Kong Hee’s legal defense fees. Not once has Pringle been honest in explaining Kong Hee’s circumstances to his church or the general public. As a result of Pringle and Kong’s scheming, it is common to meet C3 members or leaders who know nothing about Kong Hee’s affairs. You will quickly learn that C3 members have been deliberately kept ignorant and uniformed by Phil Pringle about Kong Hee’s investigations and trial. (Sadly, some carry the idea that Kong Hee is an innocent Christian man persecuted by a pagan government for preaching the gospel.) Pringle has helped Kong Hee travel to overseas churches and campaign his innocence to gain the necessary financial support for his lawyers. The behaviour of Kong Hee and Phil Pringle are causing people to rethink why Singaporean authorities are allowing these men to operate in this manner. Last year, CHC members had shown concern regarding Kong Hee leaving Singapore to campaign his innocence and rally financial support in places like Victory Life Centre. Last year, we had a churchwatcher comment about Kong Hee speaking at Victory Life Centre in Perth. Kong Hee is at Victory Life Church’s annual Conference today in Perth, Australia and is doing a stunning performance. Most of those people and even the Leadership there seem to have NO IDEA what he, Sun and others have been up to…..am expecting that he will happily receive a “LOVE” offering to cover the expenses of his brilliant acting career….the fleecing continues in another country……unbelievable! This churchwatcher gave us the impression that Kong Hee was portraying himself as innocent to con people for financial support. Unless Kong Hee provided more information outside these sessions, the commentor may have been overreacting. However, when we received the sessions of Kong Hee, it is clear that the footage at Victory Life Centre edited out information Kong Hee said about his case. We need to ask the question: What is Kong Hee and VLC trying to hide? It is of our opinion that Kong Hee was speaking dishonestly at this conference. In saying this, Kong Hee also bought up the Yonggi Cho scandal to the people in Perth. We would like to know if Kong Hee has informed his CHC congregation at any point in time about the Yonggi Cho scandal prior Cho’s charges. We invite you to offer your thoughts on the below videos of Kong Hee. We focus on the love of God our heavenly Father. And you know the last time I came I talked about the love of Abba. Every focus on the communion, the help, the wisdom of the Holy Spirit. We thank God for our many lawyers and many advisers. But when all is said and done, we know the victory’s gonna come from the Lord and no one else. So we focus. We turn our eyes on Jesus every single day. And I know that you’re here today- and we live in a broken down world, where bad things do happen to good people. And I want to leave a final story to encourage you. Because if I can do it in Singapore, you can do so much more. In a country that where you have so much blessings. You know, one time a group of tourists went to the Louvre Museum in Paris. And I don’t know – have you been there? But the Louvre Museum is viewed upon as the greatest art museum in the whole world. Well, in this group of tourists, there was an international chess champion. So they’re walking, walking, walking and they came across a painting. A very interesting painting. And this painting, if you look, is called ‘Check Mate’. It’s called ‘Check Mate’. It’s a picture of a man playing chess against the devil. And he is- he was so stressed out. His hands- his head was between his hands because it seems like all steps are gone. I mean he’s check mate. And the devil was looking smug and laughing. And basically he’s dead. The group look at this painting and they move on. But the chess champion stay back. He was staring at it. He was staring. Staring at it. Staring at it. Staring at it. Staring at it. Let me tell you, the same is true for you and me. Many of us have a wrong vision. Many of us gotta change the name of our vision. So our heads our down. It seems as the devil is laughing at us and there’s no way out. It seems like we’re finished and we are dead. But I am here to tell you that just like I am doing it in Singapore, you can do it in Perth Australia, that our king has one more move. We’re gonna come out victorious! “You see we mustn’t get distracted by the noises and the chatters that are out there especially as we come to the twenty first century. And there are so many noises and chatter. You know Psalms 119 verse 69 says that the Godless spread lies about me but I focus on my attention on what you’re saying. Hallelujah! You gotta focus on what God is saying. 2 Peter 1:19: “We couldn’t be more sure about what we saw and heard. God’s glory, God’s voice. The prophetic Word was confirmed to us and you would do well to keep focussing on it. Think about it. John the Baptist was a very great man. Jesus said there was none greater than him. But yet even in his greatness, he got distracted by scandalous news. See, that tells me one thing. To maintain focus is never easy. It requires mental strength, emotional strength, spiritual strength, to zero in on the promises of God. One of the greatest lessons I ever learnt was one day and my wife and I we were in Korea attending a great conference. And then- you know we- we- we got invited into the office of Dr Cho and there were a lot of preachers that day. But somehow Dr Cho just called Sun and I – just walked in together with him. The Youtube video clip that went viral showing City Harvest Church founder Kong Hee “speaking” to God was posted by a church member who said he did it to “expose Kong and his lies”. In an exclusive interview with Breakfast Network, he said that the 3½-minute clip he uploaded was a recording of a sermon the senior church pastor had delivered during a religious conference in Australia in April last year. He said he had obtained the clip last year from C3 Church Watch, a group that monitors the activities of a Sydney-based church, whose founder Phil Pringle is currently an advisory pastor with City Harvest Church. According to the member, who posted the clip on Youtube under the id “anointedforworship”, Kong had made the same remarks during a church service last year to City Harvest members as well. He said he decided to make it public only now because he wanted to “show the sublimal messages embedded in the sermon and delivered through the pulpit”. The church member declined to be named as he is still currently worshiping at City Harvest Church. He told BN: “Just to be clear, I’m posting the video not to ‘destroy the church’ but to expose the deception within carried by certain individuals who go as far as to abuse the trust and authority given to them. Since the clip was uploaded on Sunday, netizens have roundly condemned Kong’s remarks in which he compared his involvement in the ongoing court case to Jesus’ suffering. Along with five other church leaders, Kong is currently on trial for embezzling millions in church funds which he allegedly used to finance his wife’s singing career. The trial began in May and is expected to resume next month. In the clip, which was recorded about two years after investigations into the alleged charges began in 2010, Kong also claimed that God spoke to him and apologized for putting him through the trial, and that it was necessary to “bring change to your generation”. “For the first time in eight months, God, I heard Him cry. And he said ‘My son, Kong, thank you. Thank you for going through this’,” Kong told the unseen congregation. So far, the clip has been viewed more than 69,000 times, with 54 Likes and nearly 2,000 viewers expressing their disapproval. A parody of the clip featuring pop group ABBA was posted by another Youtube user yesterday. In a report posted today, Yahoo! News said it had contacted City Harvest Church for a response but had yet to receive one. Other church members interviewed said the clip may have been misinterpreted or taken out of context. Similar to how C3 Church has their propaganda agents like ‘The Know‘, City Harvest Church has their spin machine called ‘City News’. To their credit, City News has helped us understand the affairs of Phil Pringle and Kong Hee through the years. Nevertheless, they are propaganda agents of Kong Hee’s Word of Faith cult. What these ‘church’ newsgroups reinforce is their glorious, celebrity CEO leadership, CHC zealotry, the church brand and it’s overall self-righteous works. CHC’s own reporting “helps… members see that the church is part of society and we must let the judicial process run its course”? How does City News reporting like this help it’s members? 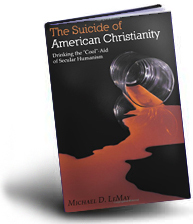 City News Propaganda: Pringle Associates Poisonous Critics To Early Church Persecutors & Murderous Radical Extremists? It seems that City News have already established their “own perspective on the ongoing trial”. If this is true, it is incredibly sad. City News is not a “dedicated news outlet covering stories from a Christian point of view”. Instead they are a “dedicated news outlet covering stories from a [Word of Faith cult-like] point of view”. If City News really cared about the Christian world view, they would severe it’s ties with City Harvest Church and act more independent. City Harvest Church’s supporters standing across the road from the Subordinate Courts as they watched the six accused leaders leave last week. Its media outfit aims to give its own perspective on the ongoing trial. SINGAPORE – Amid the media scrum at the Subordinate Courts since the City Harvest trial started last Wednesday, a few church members have been quietly taking notes and shooting videos. They are part of a core group of about 15 volunteer journalists working for City News, the church’s media outfit which aims to give its own perspective on the ongoing trial of its six leaders. Pastor Kong Hee and five other senior aides are currently being tried for criminal breach of trust. The team produces video news segments which are uploaded to its channel on YouTube, as well as online stories on the court proceedings. So far they tend to heavily feature comments from defence lawyers and church pastors. While it is not uncommon for churches to have internal newsletters and online video channels, City Harvest is believed to be among the very few in Singapore with a dedicated news outlet covering stories from a Christian point of view. 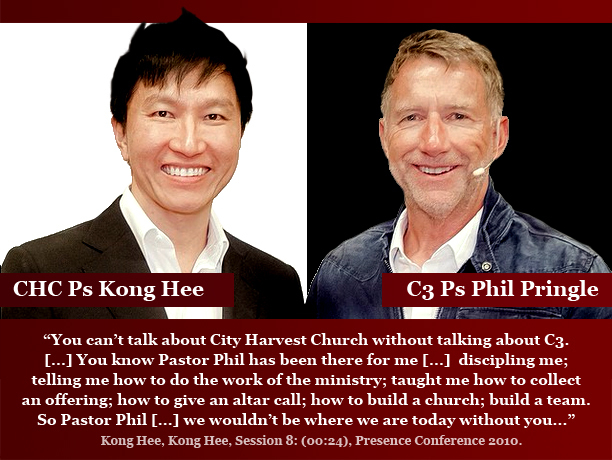 Kong Hee Says Phil Pringle Might Be Taking Over City Harvest Church? “And I just got to say that, Sun and I from the bottom of our hearts, together with our eldership, our leadership: we are very very grateful for C3 for releasing Pastor Phil and Pastor Chris to be our Advisory Pastor. And what does that mean to be Advisory Pastor? If anything happens to me, he’s taking over my church. So, you know- I don’t know- Is that good or bad news for you? Haha! 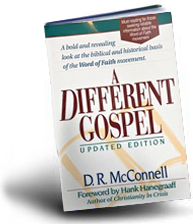 Yeah, but Pastor Phil has been a pillar to our ministry for the last three years.” – Kong Hee, Global C3 Presence Conference, Day 1, Session 1, 2013.